So you’ve decided to organise a rent strike, but what do you now? Designing an effective strategy will help you plan the initial stages of the campaign, withstand the pressure of a management fightback and help participants make democratic decisions as the campaign draws on. Term Dates - There are three terms with reading weeks and exam seasons. You will need to consider how you build momentum in the run-up to rental payment deadlines, sustain it over the holidays and address the drop in activist capacity exams inevitably cause. Rental Payments - How often rent is paid will significantly affect the path your campaign takes: each payment is an opportunity to win new people to join the strike. If rent is paid monthly, you have more opportunities to grow the campaign. However if rent is paid termly, the difficulty organising tenants ahead of first term effectively leaves only two windows for people to join the strike starting in January; the resolution of which requires careful thought. Exam Season & the Summer Holiday - This is the danger zone for any campaign: the availability of people to assist the campaign will substantially decrease in the exam season, making organising challenging - especially if too few people are involved. 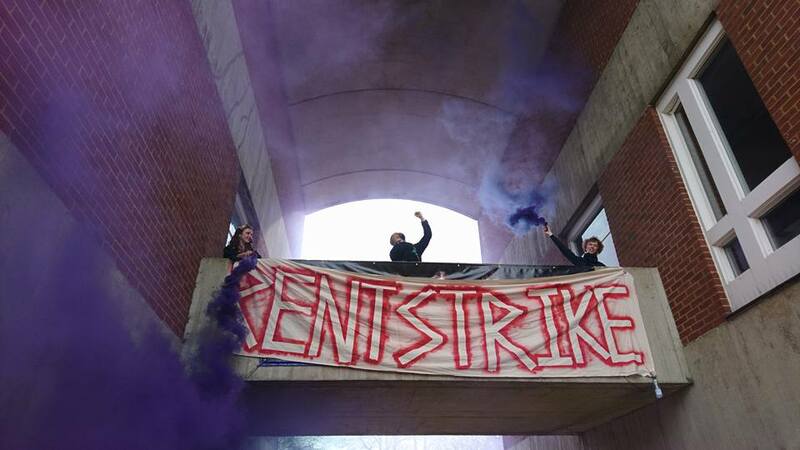 Historically, the strategy preferred by university management has been to avoid confrontation in term times; instead dragging the dispute out into the summer holidays, when atomised and scattered away from the campus, strikers can be easily picked off one by one. Concluding a campaign ahead of the Summer holiday is highly advisable and should form a keystone of planning the later stages. Once these dates have been mapped out, next you will need to consider how you intend to launch the strike. Logically, the strike can only start once a rental payment has been missed, so this date has likely been determined for you. Your timeline should now reveal the window of opportunity you have to agitate for the strike and develop the infrastructure to sustain it. The more that is built within this time before the strike begins, the more powerful the strike can become; building these vital mechanisms after the strike has started often leads to too few people becoming overstretched, democratic deficits and mass frustration. Some questions to consider include (but are by no-means limited too): How will you organise the canvassing of halls and hall assemblies? How will you communicate with strikers and make decisions democratically? How will you increase awareness to the highest possible level on Campus? Will you have the backing of the student union? How will you generate coverage in the press and on social media? How many Journalists are in your phonebook who like you? If there is a holiday between your canvassing and the launch of the strike, how will you ensure participation? How are you going to get money? Some methods for answering these questions are detailed elsewhere in this handbook, but as you start to add events to your timeline, start to think about the relationship between them and how you will build from one event to the next. For example: a stall at a freshers fair is a great way to build a contact list for people in halls; perhaps next week, you host a series of halls meetings with those people to organise canvassing; the week after you all go canvassing and now have several dozen sign ups; perhaps this is the opportunity to host a larger halls assembly; perhaps after the assembly, a campus-wide demonstration. As you encounter obstacles such as the Christmas holidays, think about how you can use events ranging from fly-posting posters around halls to social events and Christmas parties to keep the momentum up. One of the best ways to start a campaign is to start with a petition, this will allow you to get people’s contact details while also having an excuse to canvass and spread the word of the campaign. Once the petition inevitably fails and enough interest has been generated around the issue of rent on campus, you can start to build for a rent strike. The key many of us have found to a successful campaign is a strategy of constant escalation: you strike, they threaten you, you bite back—and harder. This high level of tactical aggression helps to ensure it’s rent strikers who dominate the timeline and pattern of events and not the university managers; who will attempt to use every tactic available to divide, bully and intimidate strikers. Once a strike has started, two things will require urgent consideration: how to retain the existing strikers within the strike - once management start threatening them - and how you will gain additional strikers to join you, increasing your numbers and fending off attacks. Remember: if rent is paid termly, you probably only have two opportunities to recruit people to the strike—and this cannot be wasted. The number of strikers and sympathisers needs to consistently grow, as the moment it slips into decline, you will no longer have the initiative but cede it to the management. Thus once your strike has started your timeline will need to consider a range of events and processes; from the halls meeting to the campus protest; that will sustain energy and increase awareness on campus. Again, look for ways of linking these events together on your timeline so one feeds the other: the halls assembly becomes the campus-wide meeting of the strike; which becomes the student union motion; which becomes the mass-protest; which becomes the occupation… Your timeline should also have an awareness of media-friendly events and media reportage; make sure you don’t drop out the news-cycle for long; and if you do, have some plans to get yourself back in. Perhaps by now your strike is heading for the final stretch: that towards the exam season and the start of the summer holiday. Whatever happens, avoiding the dispute continuing over summer unless you are highly confident in your position is advisable. Meaningful negotiations are predicated on both sides having cards to play that can damage each other. Therefore you will need to plan to escalate things to the highest possible level, without losing popular support or running out of term-time. Hopefully you have new strikers onboard and have used your time in Term 1 & 2 to build infrastructure that will help carry you through the exam season and support you from outside the university. Perhaps you didn’t—but don’t worry, it’s not over yet. You now need to consider the key barriers to striker participation: When do exams start? What can you do to broaden participation ahead of this? What can you do to maintain morale? What is your legal strategy ahead of summer? Remember: the earlier you consider these questions the more developed your response will be when required. And again, some suggestions to address these questions are contained throughout this handbook (see: Endgames). Researching key dates in the university calendar is likely to help you build leverage in this critical period. When the sun shines, the campus looks its best: this means conferences, alumni dinners and above all, the university open day; one of the most important days in the university calendar. Mark these days in advance on your timeline and consider how you will be able to threaten them. At this late stage of the campaign you will need to have a plan, a fall-back plan and a catastrophe plan. Perhaps this sounds dramatic, but hopefully, you will be covered for every eventuality. As the term’s end nears, having procedures in place for a contemplated legal strategy will be vital in case negotiations fail. The moment you deploy each plan should be marked on your timeline, but considered the whole way through you approach from the beginning. For example: a legal strategy against the university will perform much better if, from day one of your campaign (not just the strike), photographic evidence and emailed complaints (which are date & time stamped) have been gathered, demonstrating conditions foul legal requirements. Having the lawyers and evidence for a legal Strategy in place before you need the legal strategy, will simultaneously reassure strikers, intimidate the management and relieve pressure on organisers. The earlier such manoeuvres are considered, the more likely they are to be successful. An effective strategy is vital to be able to sustain a strike and repel intimidation by the management. The earlier key events are considered and teams put in place to address them, the stronger and more dynamic the strike can become. Be weary of moments where momentum can be lost and have proposals to recover it. Considering how you will build leverage to win negotiations well in advance will pay significant dividends when the time comes. The more thought that is given to the organisational structures of the strike before it commences, the less stress will be placed on individual organisers if the going gets tough. Events should bridge into each other to form a curve of escalation, with each point enabling the next. The rent strike is a chess game: you need to always be thinking three moves ahead. Good luck!